New World Foundation serves communities that live entrenched in poverty and are highly dysfunctional as a result of historical legacies. Although there are some significant positive exceptions, many of Lavender Hill’s children and their families are trapped in hopelessness, manifesting in poor self-esteem and apathy. These characteristics are a strong evidence of a deeply entrenched “woundedness” in the community. All attempts and interventions at facilitating development and building sustainable and healthy communities are seriously undermined by the extreme levels of unemployment that characterises Lavender Hill and the surrounding communities. Additional factors that add to the challenge are high levels of alcohol and substance abuse (especially tik), poor living conditions (housing) and poor health, gang related violence and vandalism and the diminishing importance of the male role-model as a result of the “absent male” in the communities. There is a lack of educational facilities and entertainment resources, especially for youth. In addition to this, the government struggles with effective service delivery and it seems to be difficult for the police to bring a definitive halt to the gang violence. 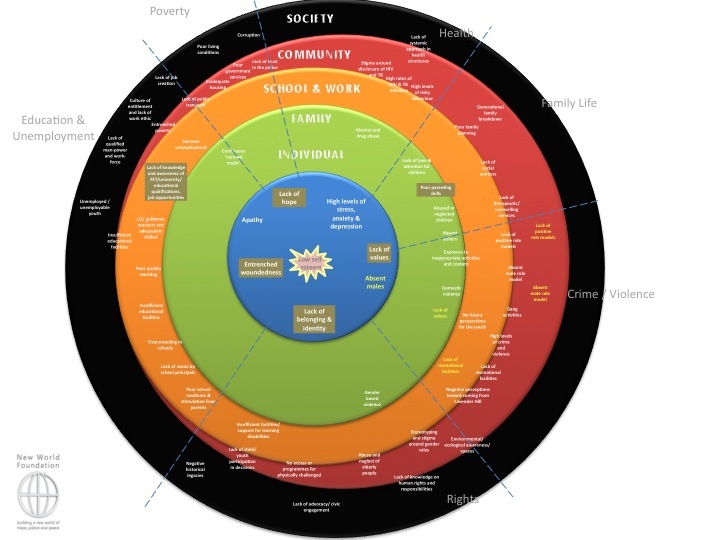 The Onion Model below illustrates an overview of all the problems and challenges that occur in Lavender Hill, as identified by New World Foundation in 2011.